iSaloni 2019 is just around the corner and today we’ll unveil a few more pieces you’ll be able to see at the Milan trade show! iSaloni is considered one of the most important trade shows, and from the 9th to the 14h of April, Milan is going to be the stage of this amazing fair. Today, we’ll unveil some more lighting pieces that will brighten the 58th edition of the Italian Fair. DelightFULL is known for its exquisite lighting designs, and you can visit the brand’s booth in PAV 13 | Stand H24. See which are the best mid century table lamps you’ll see there! 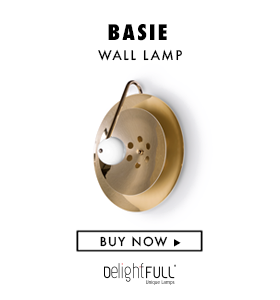 READ ALSO: MID-CENTURY WALL LAMPS THAT ARE GOING TO HIGHLIGHT ISALONI 2019! Who said that table lamps have to be small? Billty talble lamp will prove you’re wrong! A peculiar mid-century lampwith an articulated shade, so you can redirect the light. The ideal office lamp to place on your desk and keep you sharp on your daily tasks! Donna Table is a sophisticated and elegant lighting design, handmade in brass and marble. The perfect choice as your entryway lighting fixture. READ ALSO: INTERIOR DESIGN PROJECTS: DISCOVER THE BEST HOME DÉCOR OF ALL TIMES!